On February 7, 2017 from noon to 1:00 p.m., attorney Mark Barnes will discuss Ohio’s new medical marijuana law as it pertains to employers, at the Swanton Community Center in Swanton, Ohio. 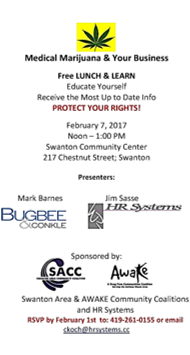 Free lunch will be provided by sponsors Swanton Area Community Coalition, AWAKE Community Coalitions, and HR Systems. RSVP by February 1, 2017 to 419-261-0155 or ckoch@hrsystems.cc. See the flyer for more information.